You are a Japanese muralist who divides her time between Berlin and Tokyo. Give us some more background about yourself as an artist and why it was important for you to attend a residency at this point in your career. I’ve been working as an illustrator in Berlin. Most of my works have been done on paper or screen. In 2012 I had chance to work on my first mural and I found it was challenging to paint large scale and develop new style of my art at the same time. Visiting a new county as an artist has great meaning for my art practice, and provides me with much more daily intention and concentration. Traveling energizes me and also reinforces the idea that the art world is very large and interconnected. Being part of the community in a residency means involving yourself, interacting with others, creating ideas, and being more conscious of your own existence. I was hoping to break my daily routine by adapting to the local culture, communicating with new people and seeing how my visual language could surpass my current limits. I didn’t plan any project before I travelled to Chapala, because I wanted to explore physical and emotional experiences inside the residency house and outside in the community. I also wanted to discover public spaces where I could present my art. I tried to absorb as much information as possible everyday and then figure out how I could communicate through my visual language. I found 360 Xochi Quetzal on the Res Artis website http://www.resartis.org/. 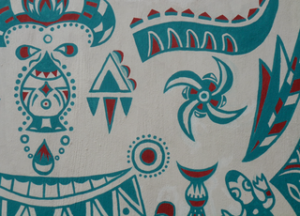 I have been interested in tribal art since I started painting murals. Therefore I thought visiting Mexico would be a great opportunity to learn about Aztec culture and regional folk art and handcrafts. You haven’t been to North America before. Tell us about how you found your way around Chapala and explored the region. Loads of things were new to me such as the colorful houses, street dogs, nature, climate, and unpaved roads. I wasn’t able to speak Spanish, but Mexicans are very friendly. After few days it wasn’t necessary to be scared to talk to anyone. Mexico is much less organized compared to my home country, which often made it more difficult to figure out how to get what I needed. But that was part of the adventure. You were able to complete two murals during your residency. Your imagery is very Aztec. What are your creative sources and what ideas were you exploring? I have been studying patterns in nature and tribal arts. I visited the National Anthropology Museum in Mexico City and Regional museums in Guadalajara where lots of art objects captured my attention. Through them I learned about the historical background, spiritual messages, and deeper meaning of primitive crafts. 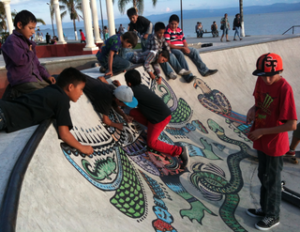 The imagery of my murals grew out of this study and the influence of the world around me in Chapala. Your previous artist residency was in Berlin. How did this focused time in Mexico compare to that experience and how did it influence your work and thinking? During the artist residency in Berlin, I lived and worked with ten artists for three months. We had weekly programs and frequent deadlines to prepare presentations. There were always other people around to discuss or share my ideas. In Chapala, I lived alone in a house and my schedule was entirely up to me. I challenged myself to concentrate on my work, make productive use of my time and create my own deadlines. It was great opportunity to practice self-discipline. The writer, Karen Lentz, was living in the other residency house where I painted the first mural and it was great to connect with her. As a muralist, your work takes you into the community. Tell us about the people you met and things you learned. 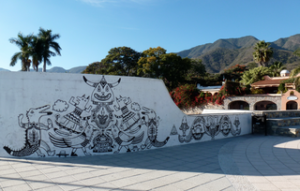 The first mural was located near the Chapala Malecon, which is a very busy street in a residential area. During the seven days I was working on the wall, I spoke to neighbors, parking workers, garbage collectors and the roaming Mariachi bands. Day by day I felt more involved in the local culture, and even learned some Spanish. During production, I met a Mexican man who introduced me to people at the Chapala city hall who paved the way to approving the second mural. 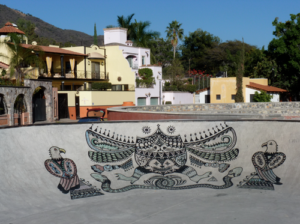 I painted the second mural at the Ajijic skateboard park, which was another small village by the lake a few towns away. I was able to easily travel there by bus. There were lots of youth and ex-pat Americans and Canadians who stopped by to watch my progress. Everyday I met new people from diverse backgrounds and found ways to connect and discuss different points of view. What were some of the highlights of the residency and what parts were hard for you? As a Japanese, I learned many differences between our cultures. People in Mexico have more freedom than in other cities or countries. If I could speak Spanish, I would have had more of a chance to communicate with the local kids who enjoyed watching me while I was painting on the wall. One of the important things I realized during the residency was a heightened awareness about the connection between humans and nature. Being at the 360 Xochi Quetzal residency was definitely valuable and will lead to the next step for my art practice. How did the natural surroundings and lush colors of Mexico influence your work? Most of the buildings in big cities tend to have sober colors. Here, homeowners could freely express their creativity and choose a wide range of colors that illuminated the streets. I loved the combination of vivid colors on the homes and gardens contrasted with the dusty streets and bright blue sky. As a result of this influence, I decided use color for my first wall instead of just black and white. Although I had a desire to paint a wall, I was open to whatever possibilities emerged. 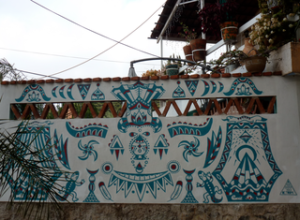 Luckily I already had permission to paint the wall of one of the residency houses before I arrived Mexico. In the end I painted outside most of the time, but I also spent time in my studio sketching, doing yoga, and writing in my diary at night. Although Mexico is a developing country, I never had a bad experience in Chapala. People are very kind and educated. I had such a rich time and am so grateful to have experienced life in Mexico.